The old song, The hipbone is connected to the thigh bone, expresses that we are part of a system in which every part is affected and affects every other part. This system includes the physical, mental, emotional, social, environment and spiritual factors (see figure 1). Figure 1. The healing environment–we are all interconnected. 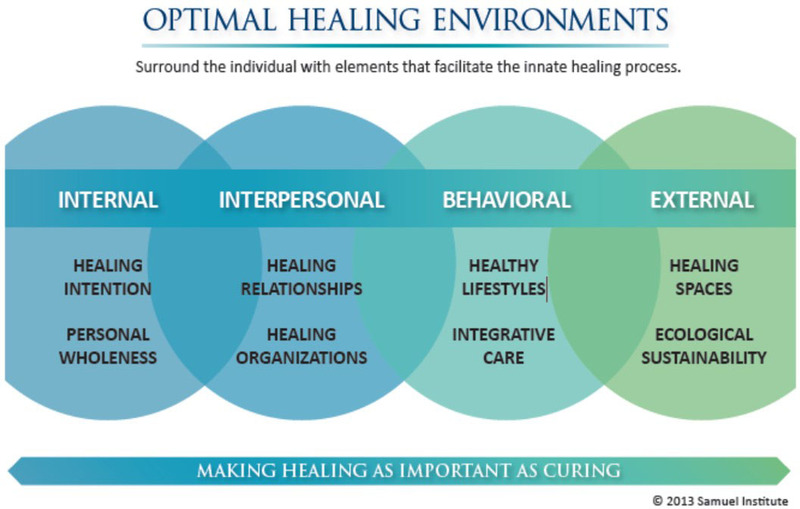 From: Optimal Healing Environment, Samueli Institute, 2013 (http://www.samueliinstitute.org/health-policy/your-healing-journey). Not only are we an integrated system, we also need to feel SAFE in order to heal and grow. Without feeling safe, we are on guard–a state that inhibits our self-healing potential. It is no wonder that sometimes people are dissatisfied with traditional medical care and visit holistic health/complementary and alternative health care providers. These professionals often take more time to listen, touch you, and make you feel SAFE. It can be challenging to make sense out of the overwhelming barrage of information available on the web. How do you know what is appropriate, what is healing strategy , or even what is a holistic perspective? To put healing in context and to offer a frame work for what is useful, the recent free book and videos by the Samueli Institute and the information on National Center for Complementary and Alternative Medicine (NCCAM)’s website are very useful (http://nccam.nih.gov). The free book Optimal Healing Environments: Your Healing Journey and video resources were developed by the Samueli Institute in collaboration with the Clinton Foundation’s Health Matters Initiative. It is a personal resource for understanding the role of Optimal Healing Environments in your personal and professional quest for health and well-being.. Go to their website and down load the free book and videos (http://www.samueliinstitute.org/health-policy/your-healing-journey). The National Center for Complementary and Alternative Medicine (NCCAM) is the Federal Government’s lead agency for scientific research on complementary and alternative medicine (CAM). The mission of NCCAM is to define, through rigorous scientific investigation, the usefulness and safety of complementary and alternative medicine interventions and their roles in improving health and health care. One of the best sources for evidence based medicine on CAM that can be used to help decision making. The NCCAM website offers free resources and comprehensive video lectures about research in complementary health approaches that provide an in-depth perspective on the current state of science, as related to complementary medicine. Topics range from mind-body pain therapies to acupuncture. Watch these online video lectures from the National Institutes of Health (NIH) Complementary and Alternative Medicine Online Continuing Education Series (http://nccam.nih.gov/training/videolectures).